RWANDAN President Paul Kagame yesterday dismissed claims by MDC-T leader Mr Nelson Chamisa that he helped him craft his country’s ICT policy when they met in Geneva, Switzerland. Mr Chamisa made the claims while addressing a rally in Beitbridge last Saturday. He claimed to have assisted President Kagame to craft his nation’s ICT policy when they met in Geneva, Switzerland, after the Rwandan president was impressed by his ideas when he was then Minister of Information and Communication Technology during the inclusive Government era. President Kagame however, disputed Mr Chamisa claims on his twitter handle. “1st my name is Kagame not kagama 2- I don’t know this man & no discussion ever happened with him anywhere . . . 3rd Rw’s ICT policy,projects & progrm started before mdc formation and politics! I wish the people of Zim.well !,” he said. Mr Chamisa’s utterances were also slammed by other Rwandans on Twitter. 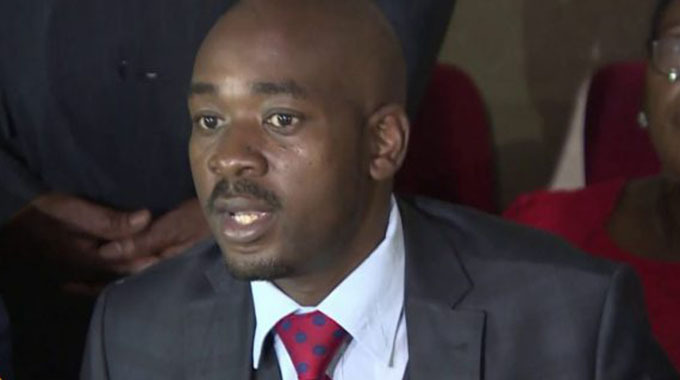 In his address during the rally Mr Chamisa said President Kagame had been referred to him by former President Mugabe. “Look what my brother Paul Kagame (Rwandan leader) is doing for his country,” he said. “I helped him on his ICT policy, on how to turn around the country when we met in Geneva, Switzerland and he was happy with my presentation. “He (Kagame) asked and enquired about me from former president Robert Mugabe and he told him that I belonged to his party Zanu PF, but I told him (Kagame) there and there that I belong to MDC party led by the late Morgan Tsvangirai. This is not the first time that Mr Chamisa has been quote lying after the US embassy in Harare disputed his claim that they had promised the MDC Alliance $15 billion in aid if they win the forthcoming elections when they went to the US with Mr Tendai Biti and Mr Dewa Mavhinga. During his visit to Bulawayo he also lied that the family of the late national hero Joshua Nkomo gave him the former vice president’s intonga (scepter) as an endorsement of his leadership. Mr Chamisa went on to falsely claim that the Nkomo family had told him that he was the first “national leader” to visit the Joshua Nkomo Museum in Matsheumhlophe suburb since Dr Nkomo’s death in 1999. The British Embassy also had to dispute another of his lies when he claimed that he had been personally invited by the Queen during his recent trip to Britain. Mr Chamisa and some of his supporters sought to reply to President Kagame’s tweets yesterday with some attacking the African Union chair. However, renowned award winning journalist, Hopewell Chin’ono writing on his Facebook page took a swipe at Mr Chamisa and his supporters’ response to President Kagame’s post. “I find the embarrassing defences by Wamba’s (Mr Chamisa’s nickname) supporters disappointing, Wamba did not tell the truth and yet their response is to mount an abusive twitter campaign calling President Kagame names for simply setting the record straight. “This is the same Paul Kagame who is the current Africa Union Chair who they might run to if they have issues with the political process in Zimbabwe,” reads part of his post. Tanzania based political analyst, Mr Tafadzwa Mugwadi also took a swipe at Mr Chamisa and his supporters. “Firstly, it shows the continued and unabated immaturity and hate oriented politics of the MDC-T and Chamisa supporters. They are trapped in the politics of the past, no wonder why they are failing to deal with rampant and deplorable cases of violence among themselves,” Mr Mugwadi said.